Do you want a deck to take to the last FNM before Allegiance comes out? Do you want a deck that is fairly cheap but really good? Want to crush people with nothing but Red cards without the issue of trying to get a different mana producing land? We have you covered! The whole deck revolves around our four copies of Experimental Frenzy to keep the ire burning for the most part. 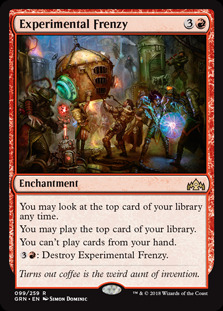 Red is NOTORIOUS for running out of steam, but thanks to Experimental Frenzy and Runaway Steam-Kin , we can combo out and play a whole lot of threats and direct damage to seal the deal. Being able to play cards from the top of your deck is the nuttiest thing we can do in Standard right now and there really is nothing like the feeling of having Runaway Steam-Kin on board and top decking spell after spell, removing those +1+1 counters to add three mana and keep going off. First up, we are playing the best recursive threat in Standard, Rekindling Phoenix , because unless it gets removed from the game or countered, it is extremely hard to deal with and it's a big beefy beater. Smacking for four in the air is nothing to scoff at, especially when the threat just won't die. We're only running two Goblin Chainwhirler because I don't play a lot of aggro Red decks, and we probably need to bump this to four. 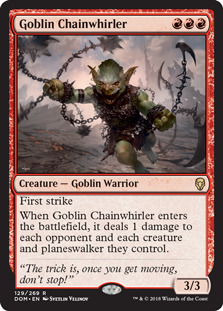 The simple fact is that Goblin Chainwhirler has amazing stats at 3/3, he has First Strike AND he deals one damage to everything the light touches on your opponent's field. This also means it can help do an extra damage to kill a creature or helps wipe out annoying Vampire lifelink tokens. Selesnya Tokens is one HECK of a deck, kids. 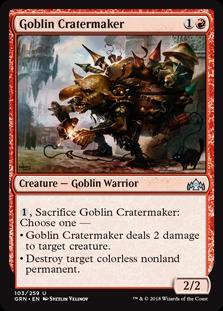 Speaking of Goblins, we have three Goblin Cratermaker , a very solid 2/2 for two mana and that can be sacrificed to either do 2 damage to target creature, or destroy something like Treasure Map or Karn, Scion of Urza . But other than that, we should replace these with Goblin Chainwhirler and thank me later. 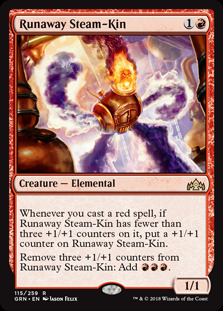 We have three copies of Runaway Steam-Kin that allows us to "combo" off. When you play a red spell, it gets a +1+1 counter. if it has 3 counters, you can remove them to add three red mana to your pool. Yes, you heard that right, playing spells that are red makes it SWOLE, making it SWOLE means combo potential, means you die now KTHXBYE. Three copies of Ghitu Lavarunner are in the deck, because this more combo style deck has less instant and sorcery cards meaning that Lavaboy gains Haste and +1 less often than most Red decks do. 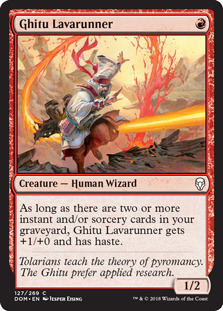 One if the best Red creatures in current standard is Fanatical Firebrand , this little guy is an auto include at four copies as a 1/1 with haste for a single Red mana, but also you can tap and sacrifice it to deal one damage anywhere you need to. SHOCK ME, SHOCK ME, SHOCK ME WITH THAT DEVIANT BEHAVIOR. Four copies of Lightning Strike because if you're playing mountains and not playing Lightning Strike , why even play red cards at all? 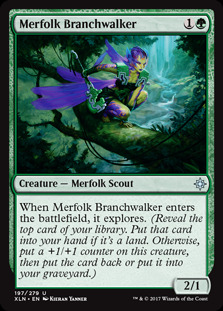 Three damage to a creature, Planeswalker or your opponents face is good return on investment. Two copies of The Flame of Keld is something I'm still testing out. When you play it you discard your hand. second turn you draw two cards plus your card for the turn and on the final turn it buffs all your red source damage by two additional damage. It can end games in your favour, it can also mark your doom. 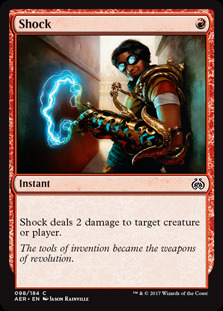 We are playing Red, so four copies of Shock are a must, you will mostly be using these to kill smaller creatures such as Merfolk Branchwalker where needed to remove smaller blockers, but you may end up needing to aim these at Planeswalkers or opponents. 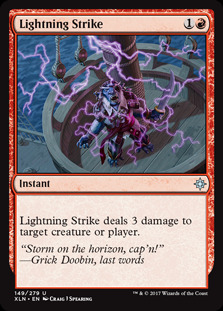 Shock is so cheap that it really helps go off with Runaway Steam-Kin as well. 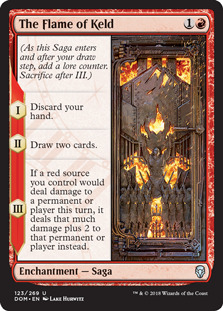 Looking forward to the future, many of the key pieces of Frenzy Red will not only stay relevant, I think we will see a lot of it used well into Allegiance standard and quite possibly beyond that. Though there is a LOT of life gain on the way and Frenzy Red REALLY struggles with that lifegain. It's likely I will revisit this deck in a few weeks and update you all if there is any new changes and tech, or maybe even if we add a colour. 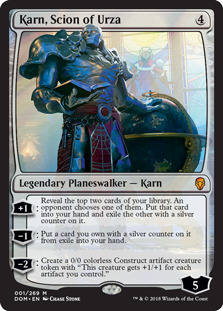 0Thats it from me today, don't forget that NEXT WEDNESDAY thanks to Wizards of the Coast, I will be getting a promo account on MTG Arena and I will be streaming the early release of Ravnica Allegiances over at twitch.tv/cheshireplaysgames. I have three exciting brews to test out!